News Article - ResponderSafety On Location! Over two days in October 2012, ResponderSafety.Com was on location in Blackwood, NJ filming broadcast-quality HD video footage for two new modules, “Intro to Fire Service Traffic Control Professional” and “Safe Fire Service Traffic Control Practices.”Originally conceived at a meeting of Fire Police executives and fire service safety professionals earlier this year, these two modules are specifically designed for firefighters and Fire Police officers who are called upon to perform traffic control duty.Traffic control is extremely dangerous, yet the fire service does not receive consistent, specific, vetted traffic control training like the police do.These two modules help fill this training gap by providing firefighters and potential Fire Police officers with an introduction to the role and responsibilities of traffic control, the overall framework of traffic incident management, the demands of traffic control duty, and the operation of basic traffic control devices.Although the modules do not make the viewer “road ready,” they lay a consistent, basic groundwork of knowledge every fire service professional should have before they take the next step of in-person training for road-readiness. 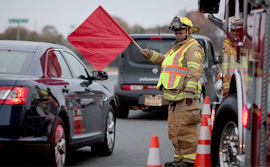 Over the two days, the production team was able to record demonstrations of traffic control procedures as outlined in the Manual on Uniform Traffic Control Devices, interview traffic control professionals, and capture b-roll footage to support more than 60 minutes of training to be released in late 2012. The video shoot for these modules took place on a road in Gloucester Township NJ that was closed specifically for the videotaping.The production team was able to tape both firefighters and Fire Police officers using many traffic control devices, including hand signals, paddles, and flashlights.In addition, an overall look at traffic direction within a properly configured temporary traffic control zone, including advance warning, was captured.These visual assets meet a critical need in the industry because proper depictions of these procedures have not been previously recorded in such a comprehensive manner. This video shoot owes its tremendous success to the cooperation from local emergency services departments, the expertise of subject matter experts (led by Jack Sullivan), the dedication of the production team, and the financial support of the National Fallen Firefighters Foundation.Local departments partnered with the NJ SAFR Task Force to provide actual traffic control, apparatus, and personnel to appear in the video in many capacities, including demonstrations, interviews, and performing their professional duties.These organizations included: Blackwood Fire Company, Blenheim Fire Company, the Gloucester Township Police Department, and National Towing (Blackwood, NJ).The Delaware Valley Regional Planning Commission provided leadership and assisted with pulling resources together.ResponderSafety.Com extends its deepest thanks to these organizations and their personnel, especially Laurie Matkowski (DVRPC), Bill Robb, Chief John Vannoni (Blackwood FC), Chief Gary Smith (Blenheim FC), Lieutenant Brian McKendry (GTPD), and Captain Jeff Weiserth (GTPD) for their tireless effort, enthusiastic attitude, and boundless support. Primary funding for the Responder Safety Learning Network is provided by the FEMA USFA Assistance to Firefighters Grant Program through a Fire Prevention & Safety grant.